Now you can have yourself on a baseball! 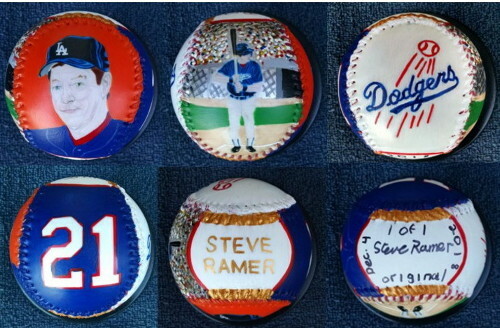 Your own, one of a kind, hand painted baseball with you on it. In full uniform. See below for a few samples. This is a one of a kind baseball. I'll paint your portrait on the front of the ball and an "action" painting on the reverse side (Batting, fielding, pitching, etc.). The other two sides of the ball will have your jersey number and team logo or name. The top of the ball will have your name. The bottom of the ball will have my signature and the date your baseball was finished. Also 1 of 1. This means that this is an original, one of a kind baseball. I'll need a large, clear photo of you in uniform and another photo of you in your "action" pose. Please make sure they are large, clear photos so I can see details. Please Allow 3-4 Weeks For Completion Of Your Baseball. I painted a baseball of myself to show you an example of what I can do for you. Check it out. I can also paint you on a full sized wood bat! Please Contact Me to order your own hand painted baseball.